“These are the tastiest biscuits mom!”, exclaimed my daughter after finishing almost half a dozen freshly baked Anzacs. My son who is less vociferous of the two, and a picky eater, had four in a go, which meant he loved them immensely. We all enjoyed Anzacs so much that I made another batch the very next day which too got over in a day. 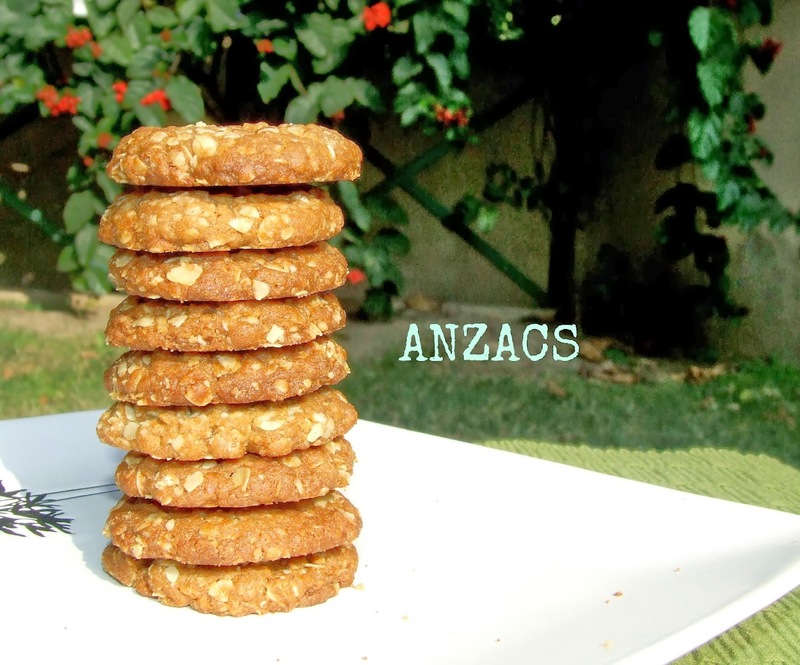 Anzacs are not only nutritious but full of energy too. 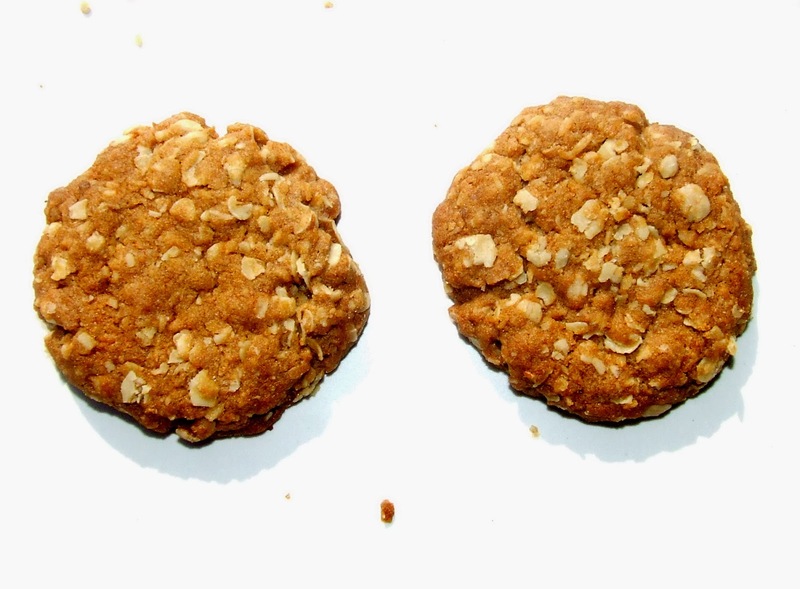 Anzac biscuits are popular in Australia and New Zealand. Anzac biscuits have been associated with the Australian and New Zealand Army Corps (ANZAC) established in World War I. It is believed that the wives of the soldiers made these biscuits for the soldiers in the war. I read the history of the biscuits here. Original recipe asks for golden syrup. I have used honey in the same quantity. Preheat oven to 160 degrees C. Grease the baking tray. Combine oats, sifted flour, sugar and desiccated coconut in a large bowl. Combine butter, honey, and water in a small saucepan. Stir over low heat until smooth. Tun off the heat. Stir in dry ingredients. Mix well. Roll level tablespoons of mixture into balls. Flatten them from the top. Place them about 5cm apart on tray. Repeat with the remaining dough. Cool and store in an airtight container. very crunchy and tasty cookies. Should we put off the gas after combining butter, honey and water before adding the dry ingredients? Yes. Put off the gas after combining butter, honey and water. I baked it yesterday and it turned out exactly as you have shown in your photos. Thanks for the lovely recipe. However, I think I will bring down the quantity of brown sugar since it was a tad too sweet for my palate. which company rolled oats have you used? Hi, I baked these cookies today and followed the recipe stepwise as suggested by you. But my cookies came out crumbley.The dough itself was crumbly and was difficult to get it together.What could be the reason? Hello, If your dough is crumbly and is not binding, you may add a little water and knead till it comes together. Generally the dough is a little hard and not very pliable. Hope this helps. Happy Baking!